Soak in cold water for about liver 30 minutes, then drain it and chop finely. Melt 100 g of butter in a saucepan along with some crushed garlic sp4cchio, saute lightly, then remove the garlic and add to the butter chopped liver. Dice the bacon and add it to the liver and cook over high heat for a few minutes. Pour the Marsala, salted, pepper and a pinch of thyme and one of nutmeg. Reduce heat and cook for 5 minutes. Remove from heat, let cool and pass through a sieve. Melt the remaining butter and mix to the liver. 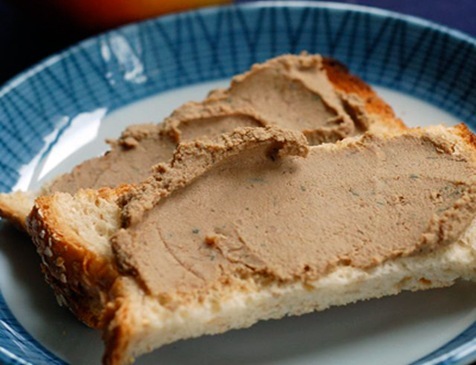 Pour into a bowl and let cool pate in the refrigerator for about an hour before serving. Good on toast and canapés.